During the summer of 1927, Canada was celebrating its Diamond Jubilee and Toronto was marking the occasion later with the presence of Edward, Prince of Wales and his brother George to officially open the Princes' Gates named in their honour. 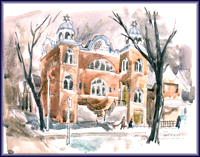 That same summer, a small congregation of Jewish immigrants from Kiever Gubernia (Ukraine) were engaged in the construction of their own heritage structure on Bellevue Avenue in the shadow of the Toronto Western Hospital - namely "The Kiever Synagogue". For "Toronto the Good" - so labelled because of its abundance of churches - this event bore added significance. The name "Toronto" derives from the Indian (Huron) word meaning "meeting place" and the word "synagogue" derives from the Greek which also means a "meeting place". All too little has been written about Toronto's early synagogues. The history of the largest congregations are well documented but not much has been done in the areas of the smaller Shuls and Shtiblach that were established by the Jews of Eastern Europe after the turn of the century. Although the first waves of Eastern European Jews were concerned with creating a proper religious environment, they were not inclined to align themselves with the larger synagogues. 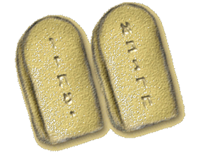 Upon arrival, they initiated smaller Shuls called Shtiblach. From each ethnic sector a group of males from the same village, town or city would organize their own house of worship to maintain their unique customs. There were Russian, Polish, Romanian, Ukrainian, Moldavian, Hungarian Congregations. The "Hebrew Men of England Synagogue" was initiated by European Jews who had sojourned in Great Britain. Shuls were established for men from Apt, Minsk, Kiev, Lagov, Ostrowiecs, Kielce, Schidlop, Stashov and Slipia. At the turn of the century, some of the Kiever Shul's families were associated with another congregation (Shaarei Tzedek) located on Centre Avenue (just east of University Avenue). A dispute arose pertaining to the burial rights that culminated in the resignation of several members, who then went on to form their own congregation, called "Chevra Rodfei Sholem" (the fellowship of seekers after peace). Louis(Yehuda Leib) Bossin and his son Max(Mordechai or Mottle) together with landsmen from Bresliv (Ukraine) carried on their religious services, initially in the privacy of the homes of their associates. The earliest congregational records show Max Bossin as President in 1912. The founding meeting took place on the 14th day of Teves (January 4, 1912). Various attempts at drafting a constitution were undertaken. Incorporation of the congregartion in 1914 was finalized by the granting of the Letters Patent by the Provincial Secretary (October 1, 1914). The formal name of the congregation is "The First Russian Congregation of Rodfei Sholem Anshei Kiev", but the shul is generally referred to as "The Kiever". In 1917, Louis Bossin mortgaged a house at the corner of Denison Square and Bellevue Avenue. The congregation relocated there and the facilities were enlarged in 1921 with the acquisition of a second house, adjacent and to the east of the first house. The measured site was 44' X 90' with a right of way over an abutting 10' lane. As the congregation increased in numbers, a larger facility was needed, and a Jewish architect named Benjamin Swartz was asked to design a new synagogue. A new structure and a building committee was established under the chairmanship of Meyer Wilson. Approval for the construction of the new synagogue was granted and the demolition of the old homes carried out. During the construction period, religious services were conducted at the home of Mr. Silverman at 29 Bellevue Place (renamed Wales Avenue). The structure was completed in 1927 and financed by a mortgage to Capital Trust Corporation for $16,000 on November 29, 1927. During the following years, new benches, the Bimah, the Ark (1931) and other furnishings were installed. Then, the Depression Years arrived and financing the operation of the synagogue was difficult. The mortgage was finally burned around 1947. Services were led by Rabbi Solomon Langner and the Cantor was Herschel Litvak, the owner of York Furniture (College Street). The synagogues performed other roles than that of the houses of worship. They had their schools and educational facilities, their social halls and their cultural centres. At the Kiever, Fishel Cooper, a veritable "Pied Piper", sporting a bowler hat, led his young minions through their post Bar Mitzva religious services. From time to time he would take them on excursions to Queen's Park as well as the further wonders of High Park. The delicately restored junior ark in the lower hall is dedicated to him and the paroches bears his wife's name. The Kiever also had its own Credit Society or "Aktzia" that loaned funds to their members to help defray some of their domestic and business debts. Started about 1930, it would shortly expire because of the economic pressures brought on by the market crash of 1929 and the enveloping Depresion. Thus the synagogues served as safety valves and security blankets for the immigrants as well as integrating the social and religious life of the neighbourhood. They were definitely meeting places where landsmen could find understanding and moral support from their fellow congregants. Many things have changed since those days, but The Kiever remains a place of meeting, moral support, understanding and worship.